Legend has it that once Parvathi, the consort of Shiva, was doing penance under the temple's ancient Mango tree near Vegavathi river. In order to test her, Shiva sent Agni (fire) on her. Goddess Parvati prayed to her brother, Lord Vishnu for help. In order to save her, Lord Narayana (Vishnu) took the Moon from Shiva's head and showed the rays which then cooled down the fire and protected Parvathi. Shiva again sent the river Ganga to disrupt Parvathi's penance. Parvathi prayed to Ganga, and Ganga did not disturb her penance and Parvathi made a Shiva Linga out of sand to get united with Shiva. The God here came to be known as Ekambareswarar or "Lord of Mango Tree". According to another legend, it is believed that Parvathi worshipped Shiva in the form of a Lingam made out of earth/sand ( Prithivi Lingam) under a mango tree. 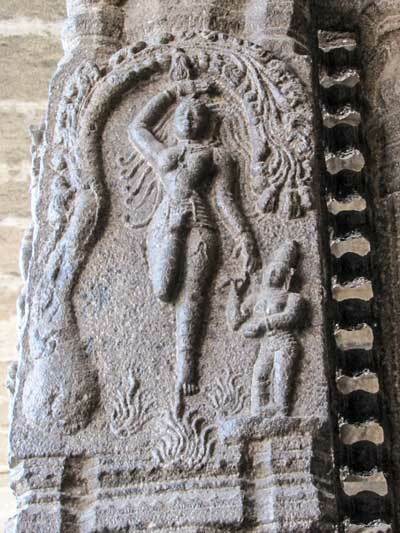 Legend has it that the neighboring Vegavathi river overflowed and threatened to destroy the Lingam and that Parvathi or Kamakshi embraced the Lingam. Shiva pleased with her penance appeared before her and married her. The Temple: The temple covers an area of over 25 acres.Reaching to a height of 194 ft (59 metres), the temple's Raja gopuram (the main entrance tower) is one of the tallest in India. In the bottom portion or the entarnce, there are shrines for Ganesha and Lord Muruga on either sides. 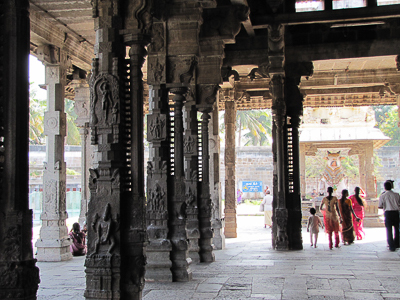 As you enter, you come across Vahana Mandapam also called Sarabesa Mandapam. To the left of this is the "Kamba theertham" and a holy dip here, is said to be equivalant to have bathed in the Ganga, Jamuna and Saraswathy rivers.Next is the Aayiram Kaal Mandapam, ( "hall with thousand pillars"), which was built by the Vijayanagar Kings. The sanctum sanctorum houses the lingam along with the image of Shiva. There are granite image of the 63 Nayanmars around the first praharam. The temple's inner most praharam has many Shivalingams, one of which is called a Sahasra Lingam with 1,008 Siva lingams sculpted on it. A notable feature here is that there is no separate shrine for Parvathi within the complex as with other Shiva temples in Kanchipuram. It is said that Kamakshi of Kamakshi Amman Temple which is nearby is the consort for Ekambaranathar. There is a small shrine for Lord Vishnu, Nilathingal Thundam Perumal temple inside the temple complex,which is one of the 108 Vaishnavite's divya desams. 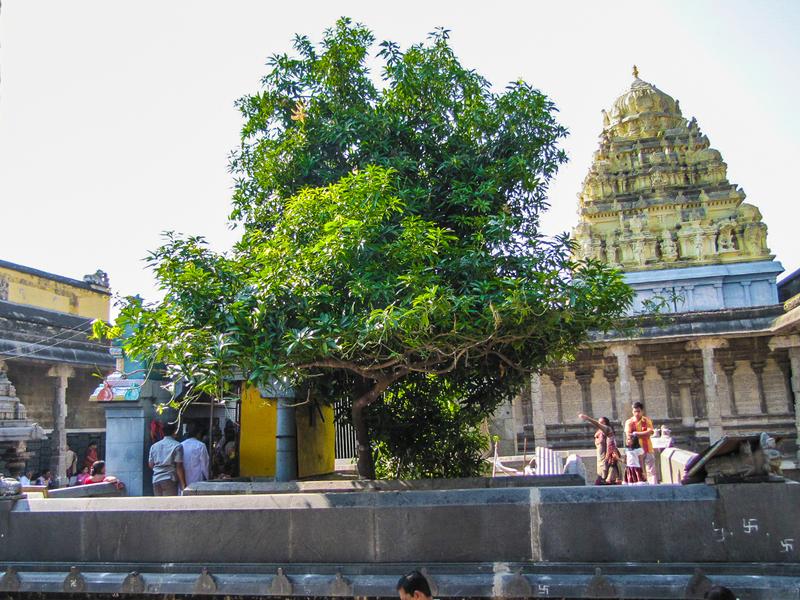 The sthala virutcham ( temple tree)is believed to be a 3,500-year-old mango tree whose branches are said to yield four different types of mangoes from its four branches. Rituals The temple rituals are performed six times a day, 5:30 a.m., 8:00 a.m., 10:00 a.m., 6:00 p.m., 8:00 p.m. and Ardha Jamam at 10:00 p.m. The four main rituals are abhishekam (sacred bath), alangaram (decoration), neivethanam (food offering) and deepa aradanai (showing of lamps) for the pedestal of Ekambareswarar. Since the Lingam is made of sand mound, all the rituals are done only to the Auvudayar(pedestal). The worship is held amidst music with nadaswaram and tavil , religious chanting of Rudram There are weekly rituals like somavaram and sukravaram, fortnightly rituals like pradosham and monthly festivals like amavasai, kiruthigai, pournami and Chathurthi. Festivals The temple celebrates dozens of festivals throughout the year. The most important of these is the Panguni Brahmotsavam that lasts for ten days during the Tamil month of Panguni(between) March and April), concluding with the celebration of Kalayana Utsavam. 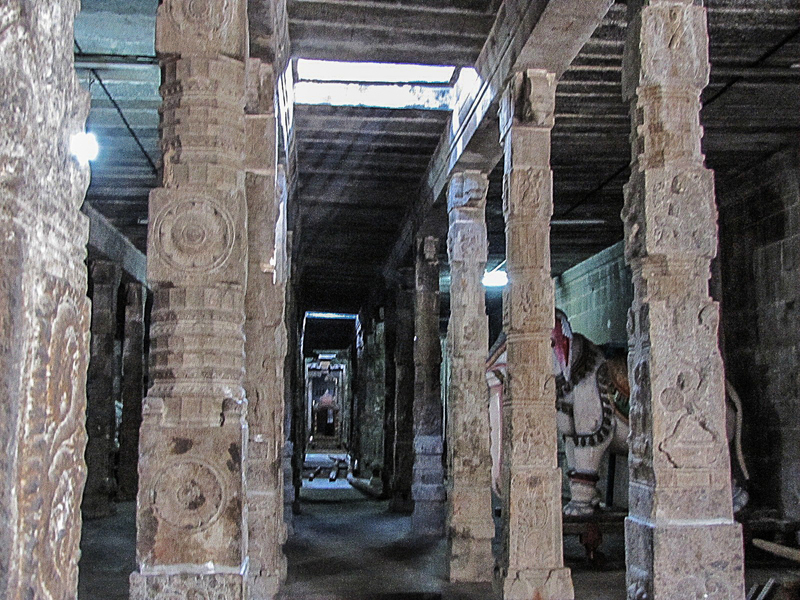 The festival is the most popular of all the temple festivals in Kanchipuram. There are various processions during the ten days with the festive images of utsavar (presiding deities) of the temple carried in various mounts around the streets of the temple. During the fifth day, Ekambareswarar is carried on silver Nandi during the morning and Ravaneswara Vahanam during the evening. The 63 Nayanmars are taken in a procession on the sixth morning, while Ekambareswarar is carried on 'velli ratham' (Silver car) in the evening. Silver Mavadi seva is performed on the ninth day. On the concluding day, Kalayna Utsavam (marriage festival) is held when the marriage of Ekambareswarar is enacted. This event is witnessed by thousands of people every year. 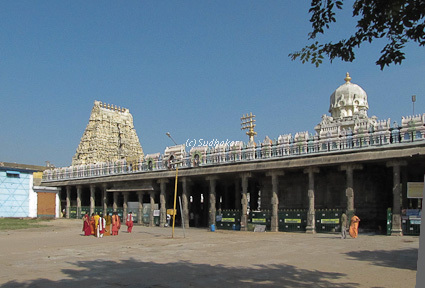 Temple location It is situated in Kanchipuram around 3.5 kms from the bus station. How to reach? Kanchipuram is around 75 kms from Chennai off the Chennai- Vellore/ Bangalore highway via SriPerumbudur. Kanchipuram is well connected by several bus services from Chennai. There is a railway station in Kanchipuram with a few train services from Chennai in the mornings. Other interesting places around Kanchipuram The famous Kamatchi Amman temple, Sri Kanchi Sankara mutt are in Kanchipuram. It is a temple town with 15 out of the 108 divya desams spread around here. Sri Perumbadur, the birth place of Sri Ramanujar and Rajiv Gandhi Memorial are nearby.